3-15-2019 Newshound/Intel Guru Mnt Goat So far, no voting in parliament on the last 4 ministers. Saturdays promised voting was not completed and postponed yet again. However no new date was confirmed or announce right away. Article quote: "The candidate of the Minister of the Interior has not been agreed upon so far, but Fayadh officially withdrew his candidacy." So another article says that the PM is now able to put his own selection of candidates forward and vote on them. We are told they plan to try again in Thursday 3/21. Thxs Ron. We can only hope. 4-25-2019 Newshound Guru Kaperoni [The new CBI bank being built makes me think they need a world tradable dinar to go along with that Big Fancy Bank!] For sure. Article VIII is coming. 4-23-2019 Newshound/Intel Guru Mnt Goat Article: "200 SAUDI BUSINESSMEN WERE ENTERING IRAQ WITH CAPITAL ESTIMATED AT MORE THAN 65 BILLION DOLLARS OVER COMING YEARS" Quote: "An agreement was signed" between the Iraqi National Investment Commission and the Saudi Investment Authority to develop a roadmap soon..." So the growth is slow but they still need the corruption gone or it will stifle any real growth in the long term. 4-23-2019 Intel Guru MarkZ [Q? : What should we take with us to the exchange apt?] I would take with me whatever you would take if you were to open up a bank account…or pick up a drivers license. ..its better to have too much and not need it then have to little and need it...I say take a drivers license, SS card, birth certificate,and a piece of mail addressed to you. This is my opinion. 4-22-2019 Newshound Guru MilitiaMan They told us...that Iraq has the full resources from the Saudi Arabian Kingdom to further their progress in re construction and oil exploration in the Sahara. This supports they are waiting on an international rate to be exposed for them to be secure in that investors are taken care of in kind, imo. They want safe and secure, a level playing field if you will. 4-22-2019 Newshound/Intel Guru Mnt Goat The news today is mostly all about getting investors in Iraq. They know they need to kickstart their economy somehow but can’t just seem to be able to do it with any level of success. But the news today suggest maybe they might move ahead finally in the coming weeks and months. 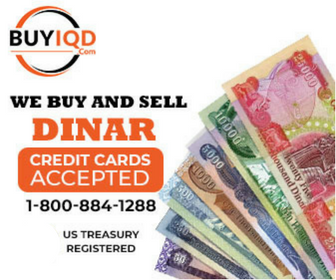 There are still no signs from the CBI of an urgent pending reinstatement of the dinar any time soon... Article: "POST OF GOVERNOR OF THE CENTRAL BANK OF IRAQ" Quote: "It is noteworthy that some sources said earlier, that the post of governor of the Central Bank will be a coalition led by Moqtada al-Sadr." I am seeing that Sadr is NOT pleased with the efforts of the CBI and still feels it is enormously corrupt and not doing all the necessary actions too deal with it. Sadr also wants currency reform and wants it NOW.